Fitting the Sony mex-g820bt went well. As expected in a 4x100 unit it drives the rest of the system quite hard. Lots of bass which suits me and my raver music. Good bluetooth connection for music streaming but a slightly delayed audio if you watch a video on the phone with the car giving your audio but not irritating. One quite clever thing is the ability to synthesise a higher sound structure as in it can lift the sound focus out of the foot well and into the middle of the windshield without separate tweeters. I suspect that with a set of component speakers it could do magic! It has a downloadable app for the phone but I haven't been there yet. All buttons and screen colours are customizable to suit your dash colour. Generally speaking a good upgrade to my pioneer. Lambert wrote: Fitting the Sony mex-g820bt went well. As expected in a 4x100 unit it drives the rest of the system quite hard. Lots of bass which suits me and my raver music. Good bluetooth connection for music streaming but a slightly delayed audio if you watch a video on the phone with the car giving your audio but not irritating. One quite clever thing is the ability to synthesise a higher sound structure as in it can lift the sound focus out of the foot well and into the middle of the windshield without separate tweeters. I suspect that with a set of component speakers it could do magic! It has a downloadable app for the phone but I haven't been there yet. All buttons and screen colours are customizable to suit your dash colour. Generally speaking a good upgrade to my pioneer. Big fish. Little fish. Card. Board. Box! If you can't feel it in your chest, it isn't LOUD ENOUGH!!!!!!!!!!!!!!!!!!!!! Oh and the best bit about being a raver; if you can remember it, you obviously weren't there! While I am very tempted Ermintrude is still a works van and not my private car so I have to at least try and moderate my spending to suit. Hence single din and not full double touch screen etc etc. I have a Sony head unit with remote control in mine. Single DIN size. Was thinking about putting a double DIN touchscreen model in. Has anyone had issues with all the shaking and rattling that goes on breaking the display? 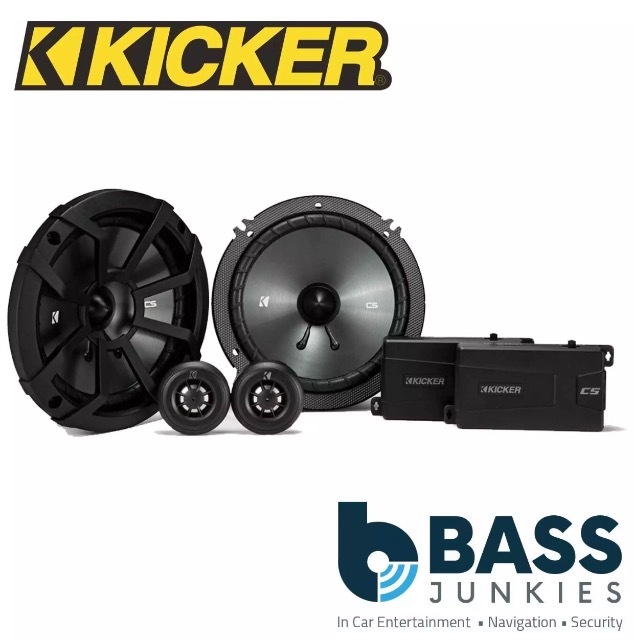 I have this Kicker speaker set up in the back. The pumping bass gives me about 2mph quicker on the motorway. Have to say I have yet to shake my system to bits but I don't drive that hard off road. Plus the hu is bolted into the dashboard so it should be reasonable for rigidity.